Can you vacuum your carpet too much? Yes. Can you vacuum your carpet too little? Yes. You can keep your carpet looking good and make it last with regular cleaning and proper care. The best (and easiest) way to remove dust, dander, and dirt is regular vacuuming. 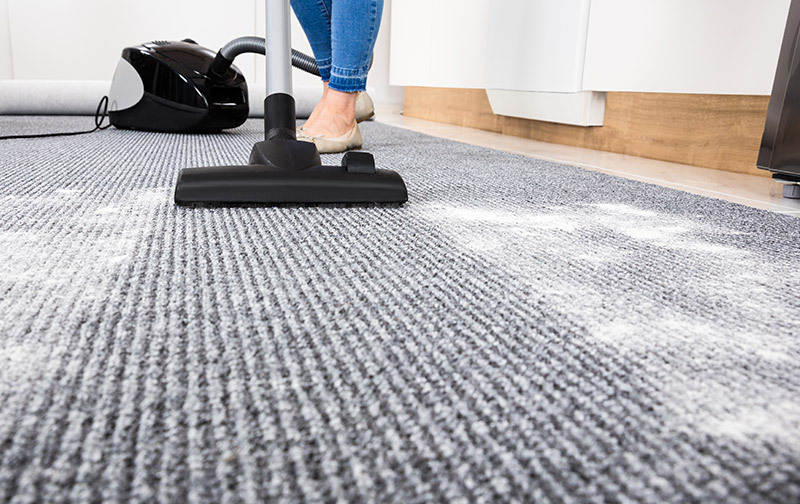 After an accident, you should vacuum up any messes and remove spills at once to keep stains from being ground into the carpet. Don’t let liquid dry or loose debris fall onto your carpet. Spot sweep carpet as needed. Vacuum your carpeted rooms once a week even if they don’t look dirty or appear in need of vacuuming. By doing this, you will refresh the carpet pile and remove debris. Make sure you have strong suction. Empty your vacuum canister or vacuum bag before you sweep your floors. Don’t forget to dust first. That way you can pick up any fallen dirt stirred up while dusting when you vacuum. Remove small objects from the floor so you have no obstructions when vacuuming. To keep your carpet looking new, vacuum low- and medium-traffic areas twice a week or more. Spot sweep as necessary. In high-traffic areas, vacuum your carpet daily to keep the pile from matting. Dirt and heavy traffic will cause permanent damage to your carpet. If you can’t lessen traffic on your carpet, keeping your floors clean is your best defense. Proper vacuuming will help keep carpet in shape and keep your whole house clean. Use slow repetitive front-to-back motions in an overlapping sequence and move to the left or right every three to four strokes. Be sure to change the direction, too. Don’t forget about occasional deep cleaning. To get the most out of your carpeting investment and avoid dull floors, most manufacturers suggest professional cleaning every 12-18 months.